In Alresford, the Giles Group is a local community organisation that provides elderly and disabled members of the community (and their carers) with a monthly meeting and event, a monthly outing in the town Minibus on the following week, and a weekly open house coffee morning on a Tuesday in the Phair Hall Community Centre to enable members shopping in the town to sit down and have a warm drink. Many of the speakers that come to give presentations to the regular monthly meetings have asked about having a laptop slide projector to show their pictures, and this had produced a problem for the Giles Group. After borrowing projectors from other community organisations, the opportunity arose to request the funding to purchase a unit, via the Winchester City Council community small grants scheme. With an annual budget and expenditure of around £1100, the Giles Group could not afford this sort of projector from their own resources. 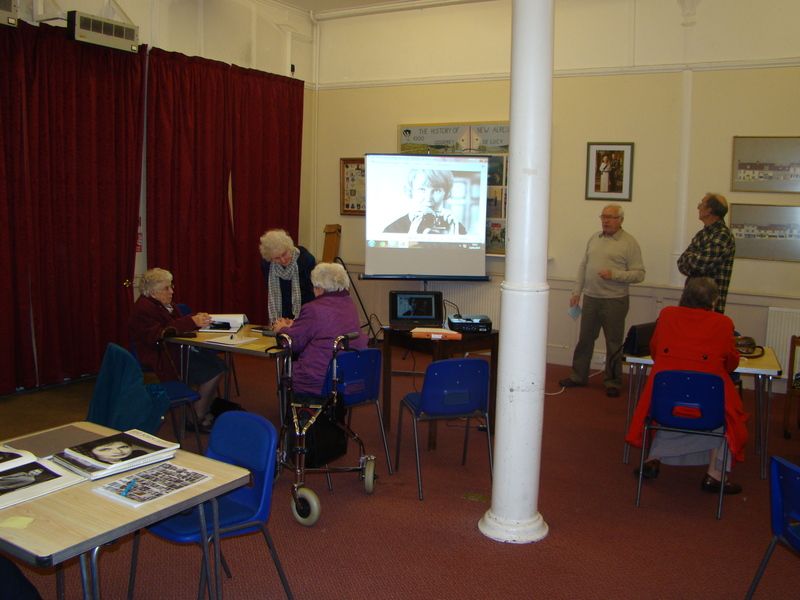 Having applied and won a grant from WCC for £219 to purchase such a projector, the group had their first demonstration of what it could do at the recent January meeting: around 25 elderly and disabled people enjoyed a quiz, where around 30 photos of their organising committee, taken from old photo albums when they were much younger, were shown. They had to choose from the eight possible names, which photo belonged to which committee member! Highest correct score was 17: obviously the equally elderly organising committee have not kept their looks particularly well! 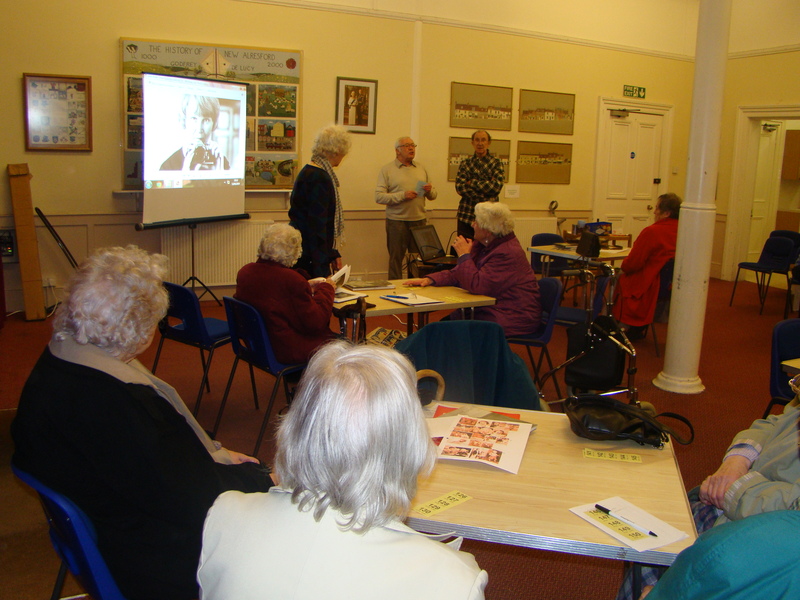 The meeting then went on to review and discuss some photographs taken by Jane Bown, the local portrait photographer who worked for the Guardian newspaper (see the separate story about the same display in the Alresford Library). All the 25 or so members attending enjoyed the afternoon, even if the questions seemed hard! The meeting finished with tea and cakes, followed by the normal raffle, and the NATT Town Minibus delivered some of the more far flung Alresford residents back to their homes. The photos show some of the discussion following the slide shows. The Giles Group celebrates its 20th Anniversary this year, having been founded in 1994. Meetings are held on the second Monday of each month at the Phair Hall, the Community Centre in Alresford. Coffee mornings are held every Tuesday in the Phair Hall, from 10 till 1: why not come in and meet us? For enquiries about joining the Giles Group please contact Nick Denbow on Alresford 734824, or drop in to a coffee morning on a Tuesday.